Home Dance news Entertainment News Music News Nexxlegacy slider KK Harris Takes The Cake with "Do That"
KK Harris Takes The Cake with "Do That"
LOS ANGELES, CA (April 21, 2015) – Fresh off of touring with Usher as a coveted principal dancer and starring in Nicki Minaj’s record-breaking “Anaconda” video, Kaelynn “KK” Harris (Artistry Worldwide) taps into her incredible musical talents with her debut single titled “Do That.” The fun, yet gritty dance record, produced by Slikk Muzik (Ariana Grande) and written by T-Dot, gives KK’s massive international fan base a taste of what’s to come on her debut EP coming in July. As one of today’s most respected and prolific dancers with talent and experience that exceeds well beyond her years, KK has expertly taken the entertainment industry by storm with no plans of stopping anytime soon. Best known for her jaw-dropping dance technique and stunning choreography, KK has taken the stage alongside Usher, Fergie and Gwen Stefani, to name a few. In between dancing with some of today’s biggest stars, KK tours the world teaching her captivating choreography to master dance classes from the U.S. and Canada, to Poland, Moscow and everywhere in between. She’s also in the studio recording her debut EP slated to release in July and plans to drop her debut album in early 2016. “[My fans] can expect to hear music they can relate to. These songs will make you wanna groove and vibe!” says KK. 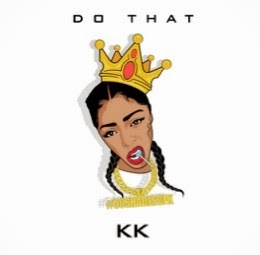 With her widespread international appeal, KK will undoubtedly take the title as the next global recording artist and superstar. “Do That,” released by Artistry Worldwidethrough Universal Music, is now available on iTunes and Amazon.